Why Should you Choose Air Repair of Southwest Florida, LLC? Quick Sales Pitch or Long-Term Strategy? Many consumers do not realize it, but there are some HVAC companies that spend almost as much time teaching their repairmen to sell rather than how to repair. 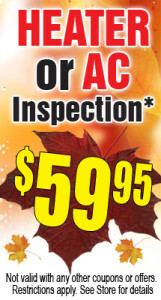 Keep an eye out for HVAC repairmen that come in, do a bang-up sales job, grab a check and go. Just like a car, your HVAC system needs periodic checkups and maintenance in addition to repairs. Look for an HVAC company that not only comes in and fixes the problem at hand, but gives suggestions on extending the life of your system. Wallace Naylor, owner of Air Repair of Southwest Florida, LLC comes to each repair job himself, evaluates the problem, and not only gives his customers a fair bid, but also suggest steps to take to extend the life of their current system. Wallace remarks, “It’s not just about fixing the immediate problem but you have to look at the long-range plan for the system”. And he should know, Wallace has been repairing HVAC systems since 1990 and has owned Air Repair of Southwest Florida, LLC since 2010. When hiring an HVAC company, observe who comes and actually estimates the job…is it one of the company’s top sales rep/repairmen or is it the actual owner of the company? Wallace takes pride in knowing that he structures his schedule so as he is able to personally attend every meeting of prospective clients and interact with that client personally. He feels strongly about getting the job done right…starting with the initial consultation all the way through the completion of the project. Since the owner himself bids on every job, the client can feel confident that there will be no surprises and can look forward to the job being done quickly and correctly and most certainly within budget. Many customers do extensive research on the type of HVAC systems they choose, others aren’t sure which route to go, in either case, you need an HVAC repairman who isn’t just a repairman, but rather is a consultant. Some HVAC companies assume that all of their potential clients have done their homework and they know what they want. There are a myriad of choices in HVAC systems out there and having a good HVAC consultant can help you navigate the various choices. Wallace comes to the homeowner’s residence equipped with specific questions to ask …i.e., Does the client want a “green” system? How efficient does the client want the system to be, etc? How important is indoor air quality to the client? Have there been any ongoing problems not addressed by other companies? Wallace will spend an appropriate amount of time getting a true feel of their lifestyle and the ways in which they will use the system to make the best recommendation. Dependable, knowledgeable, and comprehensive is an approach that Wallace Naylor at Air Repair of Southwest Florida, LLC takes seriously and is the reason for his nearly 23 years of success.